A friend of mine went away on vacation, and gave me a bag of organic onions she had bought. She didn't want them to go bad, so she turned them over to me. Onions are used in so many dishes, so I'm sure I could have finished off the bag without this soup, but I saw an opportunity to make something I never had and very much enjoy. It's a heavier, more meal like soup, so you can enjoy it on it's own, or as a side to a lighter meal. First, a quick beef stock. You can keep this simmering while you prepare the rest of the Soup à l'Oignon or you can make it ahead of time. Roast the marrow bones in the oven at 400°F for 30-45 min. Roughly cut up your veggies and chop up your parsley. Warm the oil on medium heat in a large soup pot, add the onions and garlic. Cook for 1-2 min. Add the carrot, celery and parsley and sweat the vegetables for about 5-8 min until they begin to soften. 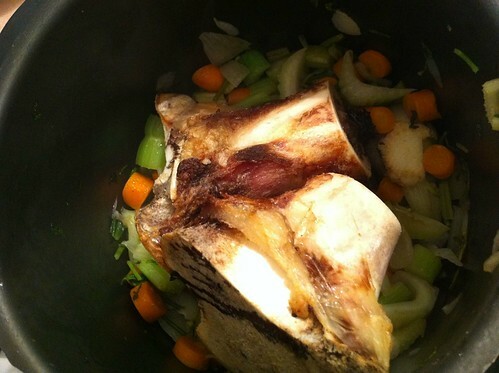 Add the roasted marrow bones to the soup pot and cover with water. Bring to a boil and simmer until desired taste- the more you reduce the stock, the more vibrant the flavour. Simmer for at least 1 hour. Melt the butter in a large pot or wok. 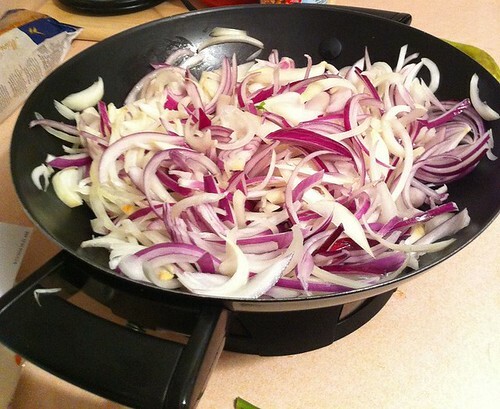 Stir in the onions and cook, uncovered until they begin to soften. Add the brandy and wine and continue cooking until they are a rich and golden brown. Transfer the onions into your soup pot and cover with beef stock. Bring to a boil, lower heat and simmer, covered for 45 min - 1 hour. Cut the bread stick, on a diagonal into 1 inch thick pieces. Cut for as many servings as you are preparing. I cut two per serving, for a little bit of extra crispy bread. Brush lightly with olive oil and bake at 325°F for about 10 min each side or until golden brown. Remove from oven and rub with the garlic cloves. Portion out your soup into individual, oven safe bowls. 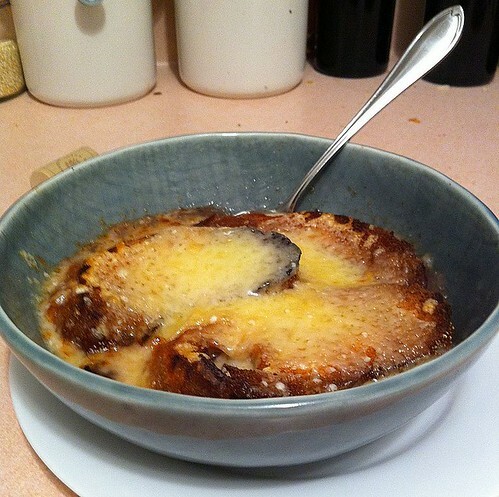 Place 1 or 2 croûtes in each bowl. Sprinkle top with gruyère cheese as desired. Broil in oven for 1-2 min.